The San Francisco Tech4Good Meetup Group kicked off the 2014 year by hosting Burt Herman, co-founder of Storify. Herman’s talk, “Storytelling for Social Good,” showcased how Storify works and how it is being used by organizations, like Human Rights Watch, to talk about social issues. 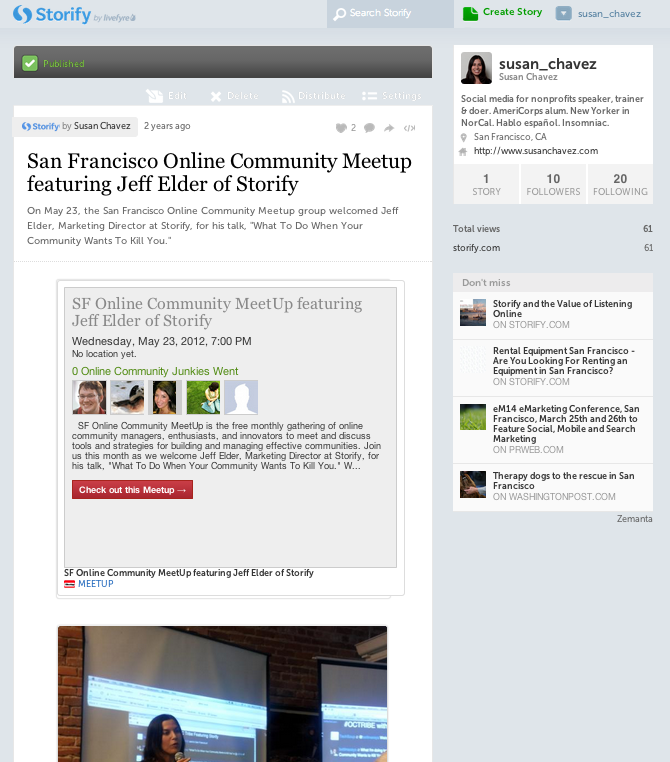 Storify, Herman noted, makes the web “social.” This quality makes Storify the ideal tool for community storytelling. By using Storify, organizations can enlist their community members as storytellers by repurposing content they are creating for social media and the web. Organizations then curate and edit the best community-generated content available across social media channels and the web into a community-powered story. Organizations can tap into the power of their community by asking members to use specific hashtags for social media content such as tweets, videos, and pictures. Campaigns and events provide the perfect opportunity to employ strategic hashtags for user generated stories. Organizations can promote a culture of community storytelling by using the “Share & notify” option, immediately available after a story is published on Storify. The “Share & notify” option, gives public, online recognition to story contributors. This recognition is key to helping your community share your story and, hopefully, continue sharing content for future stories. For more on how Storify works, check out the following video or this collection of Storify stories created by nonprofits and NGOs. Here’s a Storify story I created.